Collaborations can open brand new horizons, such as when Aerosmith made sweet, genre-fusing music with Run DMC, or when Vichy France made sweet NOTHING with NO ONE. For two artists literally putting their heads together, Pitchfork Pals. Open to the public today at Brick Lane's Stolen Space gallery, Pals marks the debut of a five-year collab from Seattle natives Mike Leavitt and Charles Krafft, who're selling both their mutual efforts and individual works in what they're calling a "sinister souvenir shop" (and yet, no "World's Greatest Criminal Mastermind" mug). 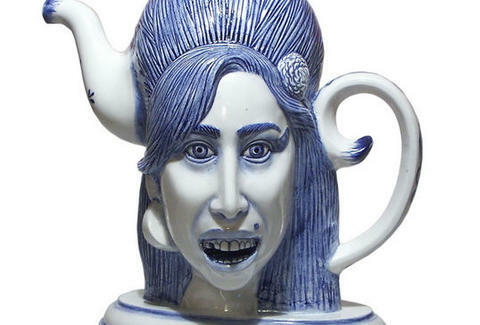 The "Pitchfork Pals" series consists of notorious celeb-pastiching fine-china teapots, busts, and Toby Jugs, designed by Leavitt and sculpted by Krafft in his basement using a 16th Century blue paint Dutch "Delft" technique, and including a smug Mahmoud Ahmadinejad, a tipsy Nick Griffin (w/ an empty shotgun shell as a handle), and a toothy Amy Winehouse -- once again cast as a pothead that gets filled with booze everyday. Individual works include Krafft's ornately decorated porcelain weaponry (a flowery "Provencal AK47", a Bluebird-depicting "Glock and Knuckledusters"), plus spades incorporating actual human bone and decorated with medieval tarot symbols; Leavitt's more street-oriented stuff includes eleven all-cardboard trainers (two of which come in a DIY kit), plus wooden takes on an old-school Walkman, Key-tar, and NES, on which you can nonetheless play Splinter Cell. Leavitt being slightly more prolific, he's also got a "Vita Vera" (real life) Monopoly set with re-written rule book (the currency is souls, the banker is God), as well as action figures, such as Michelangelo's David, Picasso, Susan Boyle, Yoda, Billie Holiday, and Michael Jackson, whose collaborations with plastic surgeons made that dude (look like a lady).